You are invited for a unique, multi-sensory experience, exploring classical music paired with specially-chosen fine wines. Get to know the hidden affinities and stories behind the music, complemented and enhanced by the individual characteristics and flavours of each wine. Savour the rich melodies, sparkling textures and lush harmonies of works by Ravel, Faure, Saint-Saens and Strauss guided by musical tasting notes from the performers themselves. Join us for an unforgettable evening of sumptuous wines and scintillating conversations! Here’s a clip of the Grieg Violin Sonata from A Musician’s Fantasy on 20 May 2017! What do YOU want to listen to right now? Live Jukebox! What do YOU want to listen to right now? More Than Music turns the classical music concert upside down with Live Jukebox! Gone are the prescriptive concert programmes and stuffy formal etiquette. Instead you, the audience, will help to choose the pieces during the concert itself and create a unique, exciting musical experience for everyone! At Live Jukebox, you will receive a ‘menu’ with descriptive categories and keywords and you will vote for what you feel like listening to. 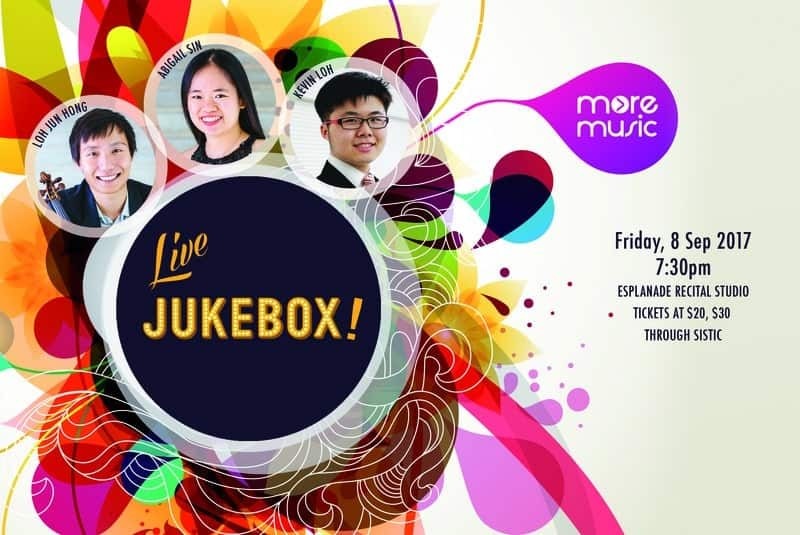 More Than Music artists Abigail, Jun Hong and Kevin will perform your top picks and reveal the pieces behind each keyword, drawing from a diverse repertoire of music by Mozart, Brahms, Ravel and a few personal surprises. A vision of paradise or a raging storm? A wistful love song or a whimsical joke? It’s your call! Join us for an unforgettable musical adventure! A little snippet from our concert, the encore piece – Grieg Violin Sonata No.3 2nd movement Side by Side on 2 & 3 March 2017! Rave Review for our 10th concert!